Over time I’ve created some PowerShell scripts that I want to reuse. And of course I would like to have them at my fingertips as soon as I start a PowerShell session. The solution to this is to create a share on the network with all my scripts and using the New-PSDrive command to map it. And since I don’t want to do that every time I open a PowerShell session, I’m going to put this in my profile. As you can see I’ve added two commands to my profile. The first will create a PSDrive “pslib” which really just works like a network drive letter; you’ll have to adjust the path to your network share accordingly. The second command, “Set-Location pslib:” makes sure that the command prompt will start at my “psdrive:” location instead for instance “c:”. OK, so that’s now all good for this machine. What about the rest of the machines in the network? 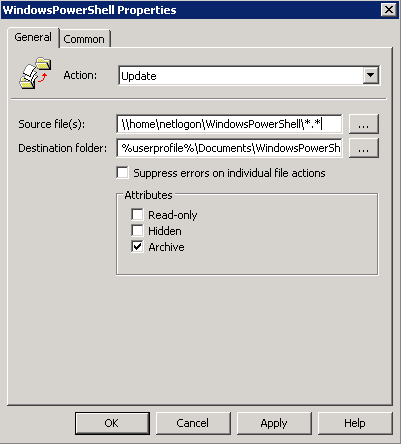 Easy, use Group Policy Preferences! As you have noticed, the profile file is located in the user’s profile path, so we need to generalize “c:\users\administrator….” to “%userprofile%\…”. This is the source where you keep a copy of the profile file created above. I’m using my domain’s netlogon share. Any other share will work, too. And that’s it! Save the configuration item with OK, wait for replication to take its course or force it, and all machines where this GPO applies should now automatically map your “pslib” drive.